iText 5-legacy : How to enable LTV for a timestamp signature? iText DITO simplifies the process of creating multiple data-driven templates. An intuitive front end gives you the ability to design your own templates and forms, tied to a powerful back end. iText DITO handles everything from HTML5 input form creation and data processing, to the output of PDFs. This reduces workload for developers by offering a way to get results without wasting time writing lines of code. Looking for advice on and pricing before you get started with iText PDF? Our sales of highly skilled professionals who are passionate about delivering excellent service can help. They will consult with you to decide on the best license model for your project. Faster time-to-revenue, cost savings and better experience are now possible with sign-from-anywhere, a cloud-based platform poised to drive consumer and business digital signature adoption forward. iText 7.1.5 is the fifth maintenance release for iText 7 Core/Community. We're also updating pdfHTML, pdfCalligraph, pdfSweep and pdfXfa. A big thank you to our Q3 top contributors! There are so many people that contribute information to us in order to help improve our code, products and projects. We want to make sure that our top contributors are being recognized for the help they give and that they know how much we appreciate them. Are you looking for an interesting job opportunity? Discover all current open job opportunities. How to enable LTV for a timestamp signature? 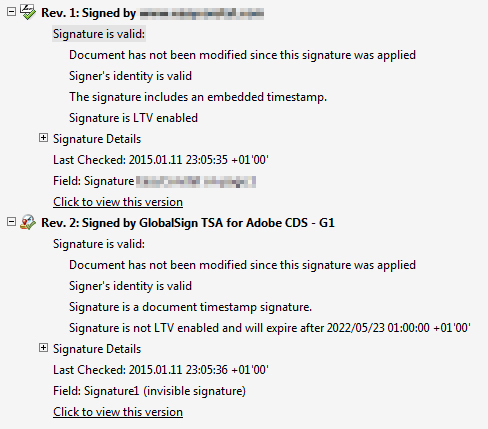 Acrobat tells me my signature is LTV enabled, but the timestamp signature is not. How can I make both LTV enabled? I'm using iText to sign PDF documents. I need these documents to be timestamped and LTV-enabled. I followed the instructions and used the addLtv() method. I get a PDF with 2 signatures, which is normal: the first is my own signature, the second is the document-level timestamp. From my understanding, the addLtv() method should get all revocation information needed and embed it in the document. Is that correct, or do I have to "manually" get and embed this information? This code identifies the most recently filled signature field of the PDF and checks whether it is a document time stamp or an usual signature. If it is a document time stamp, the code adds validation information only for this document timestamp. Otherwise the code adds validation information for all signatures. (he assumed work flow behind this is that the document is signed (for certification and/or approval) a number of times first, and then the document enters LTV cycles adding validation information and document time stamps but no usual signatures anymore. Your work flow may vary and, therefore, your program logic, too. Only after all this is done, a new document time stamp is added. The reason why the iText addLtv() example does not (necessarily) create LTV-enabled PDFs is that it is nearer to the best practices for LTV as proposed by ETSI in the PAdES specification than to Adobe's best practices for LTV. According to ETSI TS 102 778-4 V1.1.2 (2009-12) the structure of a PDF document to which LTV is applied is illustrated in figure 2. 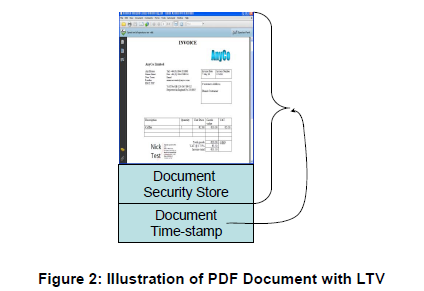 The life-time of the protection can be further extended beyond the life-of the last document Time-stamp applied by adding further DSS information to validate the previous last document Time-stamp along with a new document Time-stamp. This is illustrated in figure 3. LTV enabled means that all information necessary to validate the file (minus root certs) is contained within. So this statement of yours would be true. But since the only way for that statement to be true is for the presence of DSS, you must have DSS for LTV-enabled to appear. No timestamp (regular or document level) is required. 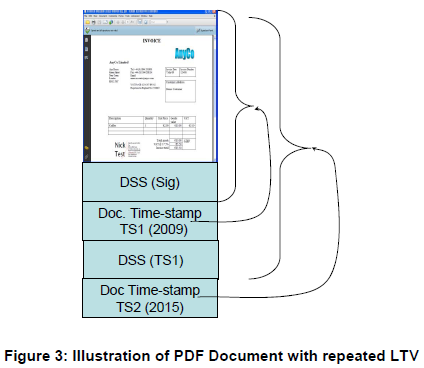 Due to this divergence PDF documents with LTV according to ETSI usually are presented by Adobe software to have one not LTV-enabled document time stamp. What does "Not LTV-enabled" mean? What is the connection between LTV and document timestamps? I've read that I need to Reader enable my document, but I can't find how to do this using iText. Since my signature was declared valid at a known and certified date, why would it become invalid in the future? As always, if you have any technical questions, you can contact support with your valid support subscription or head over to one of our community support pages on Stack Overflow to see if your question has already been answered for our AGPL users. We're happy to answer your questions. Reach out to us and we'll get back to you shortly. Join 11,000+ subscribers and become an iText PDF expert by staying up to date with our new products, updates, tips, technical solutions and happenings. © 2019 iText Group nv (HQ Belgium), Inc. All rights reserved.